Get your magnified glass out, as our next entry is one which you may think is a released game, but it isn’t quite – unless you look very closely! Captain Fizz was a cool 2 player split screen Gauntlet-style game that was released by Psyclapse in 1989 that did ok, but wasn’t too ground breaking. It was developed by Clockwize as one of their early titles. 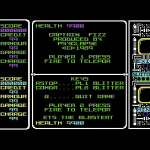 However, unbeknownst to many was that Captain Fizz was initially fully converted over to the C64 in a few weeks by Craig Wight, just before he left Clockwize. 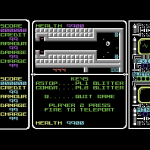 But for reasons as yet unknown, Keith Goodyer re-converted the entire game – which ended up as the final release. In early 2016, Dean Hickingbottom very kindly dug out Craig’s original version of the game – and you can now play it for the first time. But you may struggle to notice many differences – as the conversions were very close! Keith may well have used the same layouts as Craig, but just re-wrote the engine behind it. In Craig’s version, the graphics are a little lighter in places and on colour – where clearly Dean had made minor improvements afterwards. Craig’s version also notably suffers from heavy slowdown at times when it gets very busy, which could actually be the reason why Keith chose to start again with the game. 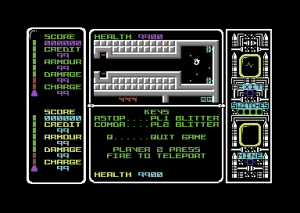 The level layouts seem to be identical, and we believe that this is actually a complete conversion – just missing music by David Whittaker (only SFX present). Hopefully we may fully learn soon why Craig’s version didn’t make the cut – but here it is, as a very nice curiosity to take a look at. Let us know if you spot any major differences!